Add flank steak and arrowroot to a large ziplock bag, toss to coat the steak with arrow root. Do not over mix. Set aside. In a sauce pan add soy sauce, water, honey, garlic cloves, fresh ginger, and sriracha. Bring to a boil and reduce to simmer for 10 minutes. In the meantime, heat a wok or large skillet to medium high heat. Add in canola oil and then flank steak. Saute for 3-4 minutes until steak is slightly browned. Add in Honey Sriracha Sauce, cover and cook for 2-3 minutes. Remove from heat. Bring a large pot of water to a bowl, add in brown rice noodles. Cook for 4-6 minutes, until just tender. Remove and then run under cold water. 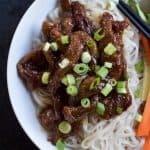 Serve Honey Sriracha Mongolian Beef on a bed of rice noodles with carrots, cucumbers, and scallions.